As temperatures climb, animals shrink. It may sound unlikely — and the mechanism behind it is not very well understood — but it’s a pattern that’s been observed many times in the fossil record, among insects, worms, crustaceans, and even mammals. Now, new research is revealing that even moderate changes to the climate can make animals become more diminutive over time. According to a survey of fossils in the American West spanning thousands of years, rising temperatures more than 50 million years ago were accompanied by drastic drops in the size of many American mammals — primordial horses, browsing ungulates, and even primates. Dr. Abigail D’Ambrosia of the University of New Hampshire and a team of her colleagues described their findings today at the annual meeting of the Society of Vertebrate Paleontology in Los Angeles, California. The most extreme episode of global warming in recent geologic history, they explained, occurred some 55 million years ago, when levels of carbon dioxide in the atmosphere and global temperatures both rose steadily over about 100,000 years. Known as the Paleocene-Eocene Thermal Maximum, or PETM, the spike in heat-trapping CO2 drove up worldwide temperatures by an average of 6° C [11° F], enough to cause one of the greatest mass extinctions in history. 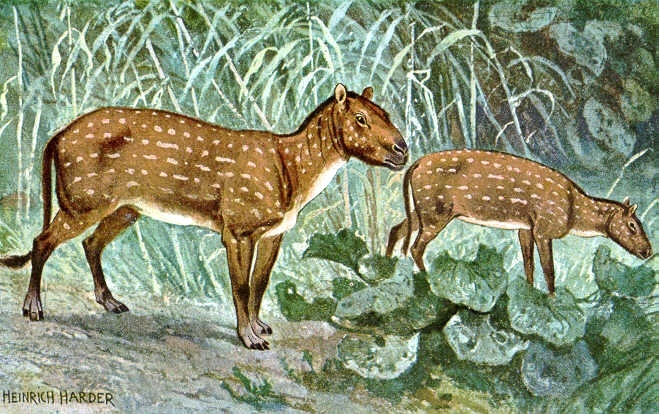 The ancestral horse known as Hyracotherium, about the size of a modern dog, became about 20 percent smaller during the Eocene warming event some 50 million years ago, a new fossil study shows. And while many kinds of mammals survived the primordial hothouse, other studies have found that their sizes decreased significantly — and then rebounded just as suddenly once the climate started to cool. D’Ambrosia and her team set out to see if the same held true for a more modest “hyperthermal event” — a sequel to the PETM that came just 2 million years later, called the Eocene Thermal Maximum 2. It, too, was associated with a sudden burst of atmospheric CO2, but was less severe and lasted only in the tens of thousands of years. Since complete skeletons of any creature are hard to come by, the team focused on the most durable components of the mammalian body — teeth — using molars as a proxy for the animals’ total size. 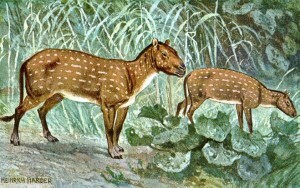 They found that a variety of mammals experienced what they call “a clear decrease in body size” during the period, from the tiny, deer-like Diacodexis to the erstwhile American primate Cantius. But, in a statement to the press, D’Ambrosia pointed out that one of the study’s most salient findings appeared in the fossils of the primordial horse known as Hyracotherium. Specifically, she said, the severity of the dwarfism in the animals seemed to correspond to the severity of the warming. “Interestingly, the extent of mammalian dwarfism may be related to the magnitude of the hyperthermal event,” she said. What’s more, she noted, fossils show that the size of the region’s mammals seemed to return to pre-warming levels once the average temperatures evened out. It remains unclear why animals become minified during these warming events — it may be that smaller bodies are better at regulating heat, or, in the case of worms and insects, higher temps might cause faster, but briefer, development and shorter life spans. Regardless of the mechanism, the team says their research has obvious implications in the 21st century and beyond, as the world continues to experience rising average temperatures and concentrations of CO2.